In a letter between the two leaders, Trump explained that her "excursion" to Egypt, Belgium, and Afghanistan had "been postponed" due to the government shutdown. 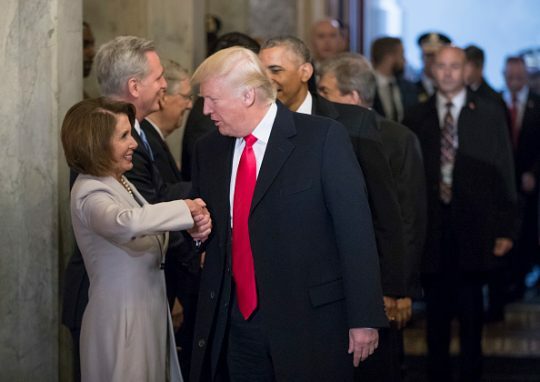 Trump told Pelosi that he thought she should remain in Washington to help resolve the shutdown. Should she want to proceed with the trip, she could do so by "flying commercial," he said. Pelosi was scheduled to leave Thursday at 3:30 p.m., according to a source who spoke to Fox News. White House press secretary Sarah Sanders shared a copy of the letter to Twitter. Trump insisted he would not sign a bill to fund the government without sufficient funding for a border wall between the United States and Mexico. Pelosi has insisted she would not give the president more than a dollar for a wall, calling it an "immorality." Pelosi was the first to use the shutdown as a reason to slight her political opponent. Earlier this week, Pelosi told Trump she would have to rescind the president's invitation to give the State of the Union address to a joint session of Congress, blaming "security" concerns. Senate Minority Leader Chuck Schumer (D., N.Y.) has pitched a proposal to provide $1.6 billion for Trump's border wall in an effort to pass a federal spending bill before the Dec. 7 deadline. Trump has set the cost of the wall at $5 billion. Sen. Richard C. Shelby (R., Ala.), chairman of the Appropriations Committee, said Monday Trump would allow a government shutdown if Democrats did not agree to fully fund the border measure. Last January, Trump offered citizenship to "Dreamers"—immigrants who entered into the country illegally as children—in exchange for $25 billion for wall funding. Trump originally promised Mexico would fund the wall, and has said in recent months it will ultimately do so through the trade deal negotiated to replace NAFTA.